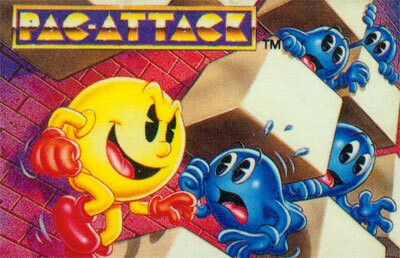 Pac-Attack is like a licensed Tetris clone. The game stars Pac-Man who needs to eat the ghosts by lining them up in colour (kind of like deja vu, right?). The main mode is called Puzzle mode, with 100 levels. There is also a VS. mode, and a Password mode. Also included is a Training mode (like Robotnik's Bean Machine's Exercise mode). Adapted from the arcade game Cosmo Gang the Puzzle.